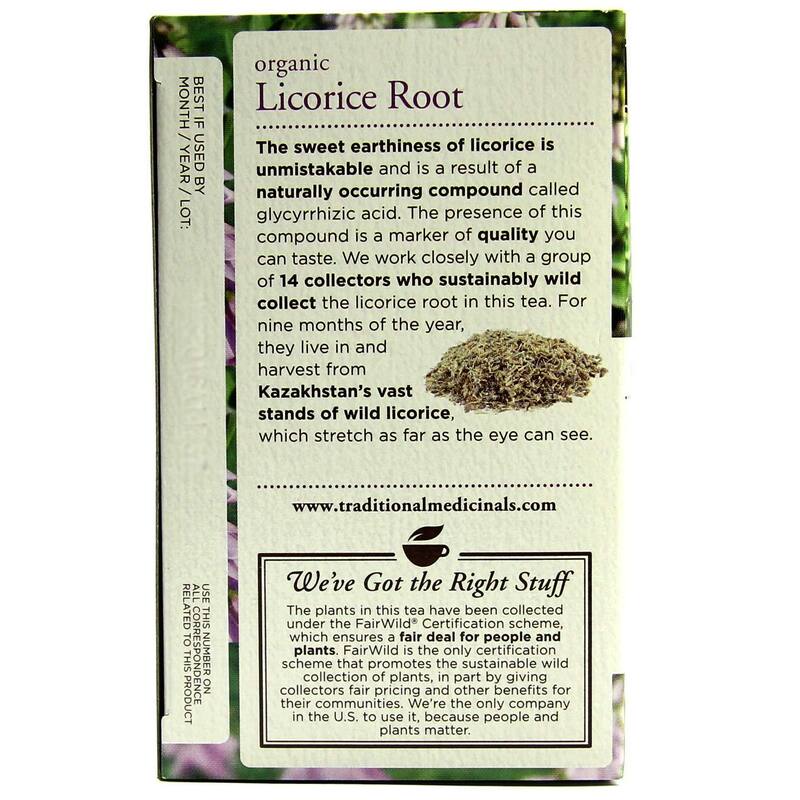 Traditional Medicinals Organic Licorice Root is a FairWild organic tea so there's nothing to ponder over while you enjoy every cup. 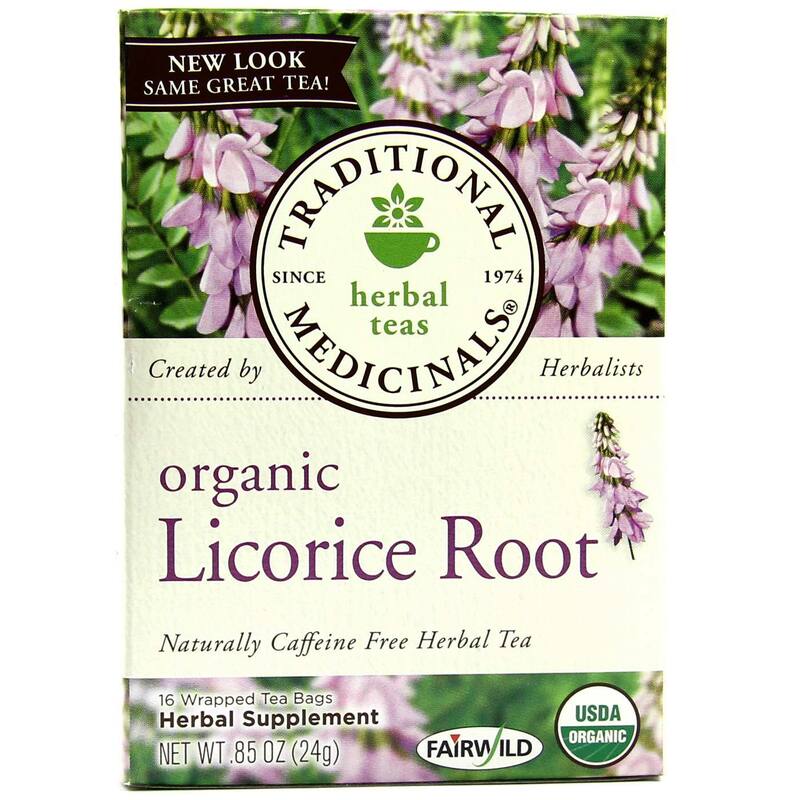 Advertências: Unless directed by your healthcare provider, licorice root tea should not be taken daily for longer than four to six weeks. 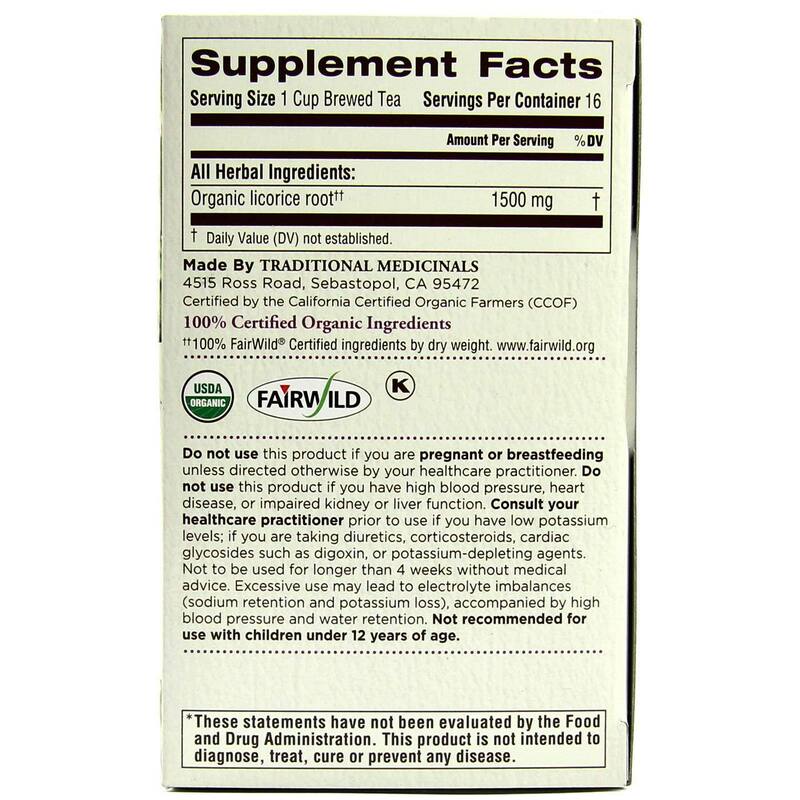 Do not use this product if you have experienced cardiovascular-related disorders such as high blood pressure, potassium deficiency (hypokalemia), impaired kidney or liver functions or cirrhosis of the liver. Do not use if you are pregnant, nursing or considering pregnancy, unless directed by your licensed health care professional prior to use. 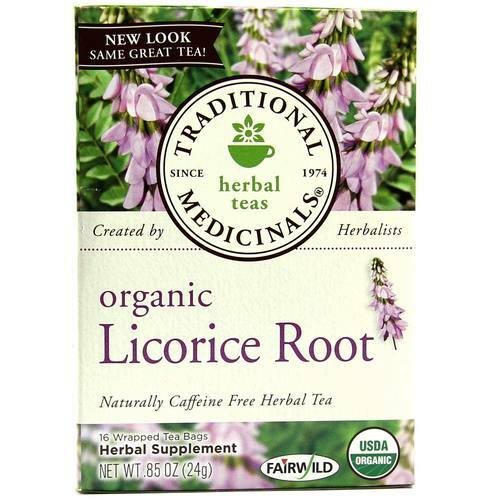 Potassium loss may occur when taking licorice root tea at the same time as other drugs, such as thiazide- and loop-diuretics. 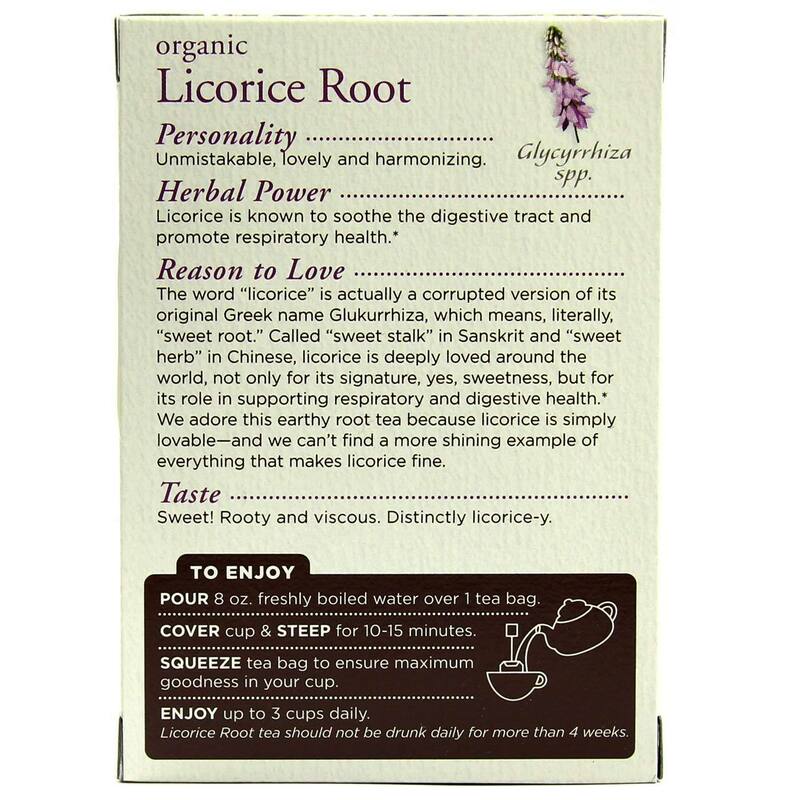 Potassium loss, resulting from excessive use of licorice root, may increase the action of cardiac glycosides and interact with antiarrhythmic drugs. Prolonged use of excessive doses may lead to mineralocorticoid effects in the form of electrolyte imbalance (sodium retention and potassium loss) accompanied by hypertension, edema and suppression of the renin-angiotensin-aldosterone system. In rare cases, hypokalemic myopathy may occur. 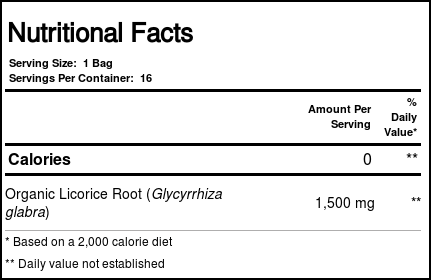 Notas: Independently certified according to the FairWild Standard and to the USDA National Organic Program (NOP) Wild-crop Harvesting Practice Standard. Certified kosher and parve. Recomendações de uso: Pour 8 fl oz of boiled water over 1 tea bag in a cup. Cover cup and steep 10 to 15 minutes. These steps directly influence the amount of beneficial components that will end up in your teacup! Gently squeeze the tea bag to release any remaining extracts. Drink 3 cups daily between meals. Sweeten with honey if desired.